How can I find bottlenecks? How can I keep track of scheduled emails? If you report over a large number of sites, it can take a while to process and render the data. If you use the Project Cache, Work Cache, or Project Status Report Cache, you can improve response times in large reports. Tip! To speed up rendering you can use either the views or CAML to reduce the number of items sent to the report. Permissions should be managed in high level groups as much as possible, especially when it comes to updating either cache. Managing permissions in this way helps reduce the overhead on reading and writing data in either cache. For display of medium to large Gantt charts, we recommend Google Chrome browser over both Microsoft Edge and Internet Explorer browsers for performance reasons. Using Views/CAML filtering can give your reports a boost. Instead of filtering after rendering, as with reporter based filtering, use Views/CAML filters on the reports before they appear. If you start working with CAML, you can make some great speed increases. 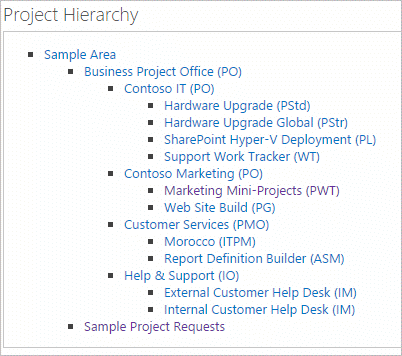 Presence is a SharePoint feature that pulls user information when hovering over their name in a list. This can be a handy feature, but can also be a burden when you have many users in a large list. You can disable presence on an individual web application to get a rendering increase. You can also disable presence on a per-column basis by editing a column and deselecting the Show Presence checkbox. You also have the option to disable presence in grouping. Older sites getting pulled in by large cross-site reports can impact performance. You can fix this by moving them into their own separate Project Area using the BrightWork Copy Site feature. You can also edit the project's BrightWork Settings and uncheck the Include Project Statement type lists in reports checkbox. Slow report rendering has been helped with the introduction of the two caches. Another way to speed up reporting is by limiting the number of items displayed in a report. By reducing the number of items, performance will improve greatly. Tip! Reducing the number of Groups in a report will also have a measurable impact when your report displays a lot of items. Having too many grouping levels may incur longer rendering times. One of the most important improvements you can make in BrightWork is to have a proper site hierarchy. You should try and organise projects with care so that your reporting does not pull in extraneous data you have to filter. A good practice is to group your projects by department, so that your department heads can get top-down reports over everything they are responsible for. Having a top level Project Office with relevant projects underneath is a good way to stay organized and keep your reports fast. If you are creating several projects but do not need the added features of a project template like Project Standard or Structured, you should consider using the Projects and Work Tracker template. It functions as a mini-hierarchy that keeps all of your smaller, lightweight projects under a single top-level project. The BrightWork Report Profiler feature gives you performance information about any report you run it on. It is useful for figuring out which reports are taking the longest to load and where the problems are. You should use this alongside other optimization techniques like CAML Filtering to fix your issues. You can track your scheduled emails in three ways: by web part, by project and by all projects. The reporter ribbon Advanced share option, View Scheduled Emails shows all of the emails scheduled for that particular report. The Scheduled Report Email list in the project's Site Contents shows all of the emails scheduled for the project. And the All Scheduled Emails Report shows all the emails scheduled in any scope you choose.